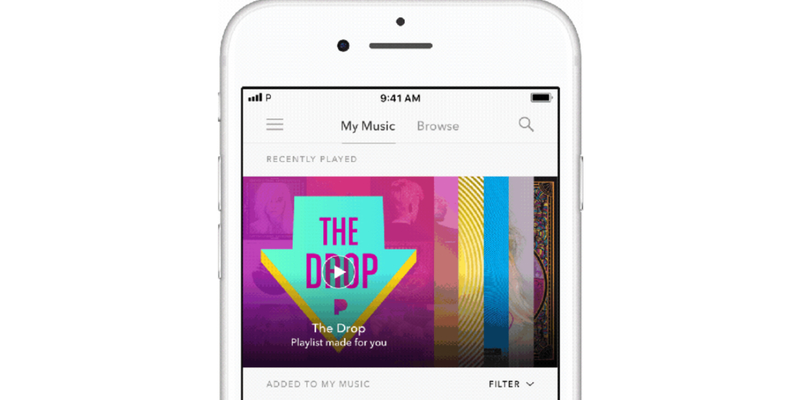 Pandora has launched a new curated playlist that works in a similar way to Spotify’s automagic playlists. Called The Drop, this playlist will automatically populate with new songs released by artists Pandora either knows you like or thinks you’ll like. To that end, The Drop will be personalized based on your listening habits. Pandora will then add songs it thinks you’ll like on the day they’re released. You’ll start with 10-15 songs, but more will be added until the playlist is packed with up to 100 songs. You know who don’t get enough credit in the music streaming service game: Pandora. They got the playlist algorithms. The songs will be listed in order, with the newest at the top. And if you find your new jam you can either add it to My Music or share it with family and friends. If you update the Pandora app you should be able to find The Drop in the Playlists section of My Music. As with everything created by algorithms, The Drop feeds on data. So if you only occasionally use Pandora you might be disappointed. However, the more music you consume on the platform the better Pandora’s machine learning will get to know you. Admittedly, The Drop is very similar to Spotify’s Release Radar, which is comprised of 30 songs which are replaced every week. Still, imitation is the sincerest form of flattery, and Pandora clearly thinks curated playlists will help it succeed. The Drop is only available to Pandora Premium subscribers, or anyone trialling the service. For the uninitiated, Pandora Premium is priced at the industry standard $ 9.99/month, although a Family Plan for up to six people is available for $ 14.99/month.